Our Guard center is constantly networked with customers. We enable the highly trained and experienced staffs to monitor 24 hours, 365 days to be ready to response if the situation requires. ALSOK Online Security System is a custom-made online security system that accommodates the requirements of various facilities, from small to large. Guard Center is used to monitor facilities and prevent crimes and disasters. 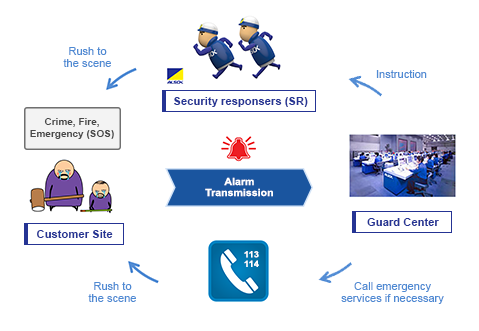 When a disturbance is detected, our security responsers (SR) will be dispatched on this time to the site.